Why do students go to school? The usual answer is to learn. But if this is true, why do students rejoice at canceled class? Why do they prefer an easy “A” instructor over a difficult one who has more to offer? Why don’t they just sit in on classes for free, which you can do at many of the best schools? And why is the final year of school so much more lucrative than other years, given that we don’t usually learn more that year? These problems and others fall into place when we consider that we go to school more for the degree than for the education. The main purpose of education is to send a signal to employers, says economist Bryan Caplan. Employers pay more for college-educated employees not because what they learned in school was itself useful, but because the fact that they got the degree demonstrates that they must be generally smart, disciplined, and conformist. This makes little difference to the individual – you should still go to school and send that signal. 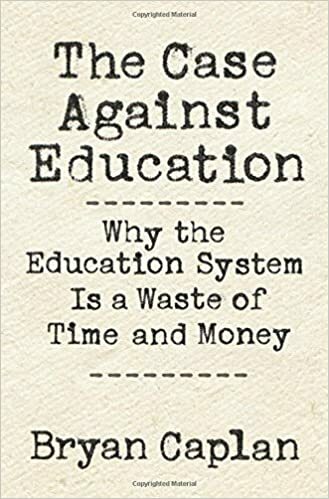 But for society, this makes education a bad deal; status, unlike learning, is zero-sum, making much of the education system a waste of resources. In this interview, Caplan explains the signaling model in more detail, addresses objections, and predicts what would happen if his prescriptions were followed. 16:34 – Learning how to learn? 20:04 – Education as “nourishing mother”?